What happens when a space shuttle returns to Earth's atmosphere? The 2010 Hurricane Season was the most active ever recorded. The United States lucked out this year during the hurricane season. There were twelve named hurricanes that occurred in the Atlantic basin but none of them made landfall in the United States. The official hurricane season ended on November 16th and no more hurricanes are expected to be named after the season this year. Ravenous swarms of locust have occurred in southeast Australia this year. They have even reached the street of Melbourne. In Victoria the insects are devouring the wheat that is just now ready for harvest.A Sydney University ecologist suggested that residents should make them into a tasty treat by throwing the insects on the barbeque. They can also pull their wings off and fry them! Indonesia's Mount Merapi Volcano Causes Thousands to Flee. Thousands of monkeys and other animals have joined people living in the area of Mount Merapi volcano to flee. The eruption began last month. Since the volcano began erupting thousands of people have had to flee the pyroclastic flows that have swept down the volcano. The pyroclastic flows killed everything in their path including over 270 people and untold number of animals. Katina, a 34-year old killer whale gave birth to her 7th calf at Sea World Orlando recently. The calf was 7-foot-long and weighed 350-pounds when it was born. The calf is doing well at this time. Each year the Himalayan Mountains grow another inch as the Indian and Eurasian plates collide pushing the mountains between them higher. The Eisenhower interstate highway system requires that one mile in every five must be straight. These straight sections can be used as airstrips in times of war or other national emergencies. Peregrine Falcons can reach speeds of more than 175 miles per hour while diving for prey. This makes them the fastest creatures on Earth. You blink about five million times per year. In the last five minutes the Earth has traveled 5,000 miles around the Sun. Be aware, if you travel to Africa, that hippos can be even more dangerous than lions. Chances that a road you are traveling in the United States is unpaved is about 1%. If you are traveling in Canada the chance of an unpaved road is 75%. Ancient people have carved rocks and drawn pictures on rocks for thousands of years. Pictures painted on rocks are pictographs. Pictures carved in rocks are petroglyphs. In this activity you will be creating a pictograph. Rock paintings preserved for thousands of years in caves depict events and animals that were important to people long ago. 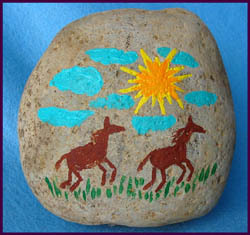 Find a rock that is a round river rock or a flat rock that you would like to use for your pictograph. Think about activities that you do every day that you could make into a simple drawing. Try to decide on things you will include in your drawing that people in the future will understand. Keep the drawings simple like the picture on the river rock. After you have decided on your pictograph draw it on a piece of paper to make sure it will fit on your rock. Draw the pictograph on your rock with a pencil. Paint the rock with acrylic paints. You can now use your pictograph as a paperweight or it can be displayed on a desk. Today scientists look at pictographs and petroglyphs to understand how people lived long ago. Often pictures of animals included in the drawings are now extinct. This gives people an understanding of what the animals looked like before they died out. The shuttle becomes extremely hot when it starts through Earth's atmosphere because of friction. The bottom of the shuttle covered with special tiles because the underneath part of the space shuttle reaches 3000 degrees Fahrenheit. The tiles are such good insulation that they can be burning hot on one side and cool on the other side. Find out more about pyroclastic flows that travel down the sides of volcanoes at hurricane speed destroying every thing in their path. Find out more about the Krakatoa Eruption and the pyroclastic flows that swept about the oceans to other islands and the tsunamis that killed untold numbers of people. Learn more about ignimbrite that forms during super volcanic eruptions and pyroclastic flows. Create some cool paper rockets and see how far you can make them fly!